One painting that you won't see by Freestone artist Tony King at the Sonoma Museum of Visual Art's newest exhibit, "The New York Experience," is NYC, Target. Depicting the kingdom of Manhattan as seen from the back of the Staten Island Ferry, the city shines in gloriously clear colors on this canvas, a muted bulls-eye target enlivening the dark depths of its borders. Conceived both as an homage to Jasper Johns' target paintings and to the city itself, King painted NYC, Target in 1991 to laud New York as the art center of the world, the target of all ambitions. Back then both of the World Trade Center towers were extant. Looking at this work today, it seems ominously prescient--which was not King's point at all. "It's so uncanny that I actually don't want to show [it]. I don't want to have to explain that I did this 10 years ago," he says, shaking his head. Which is not to say that King isn't available to answer a lot of other questions. One recent afternoon, as his paintings lay stacked against SMOVA's walls in advance of hanging, the poor man was made to talk and talk and talk as both this reporter and SMOVA executive director Gay Dawson waved recorders at him, peppering him happily with questions. Beginning with his first sight of the city at age six and traversing the many years before he and his wife, the painter Pamela Glasscock, moved their family to Freestone from Manhattan in 1992, King tried to explain just what it is about New York. "The clich´es of New York really are true," he says at one point, referring to every giddy tale of artists glorying in bohemia from the Tin Can School of painting forward. "You didn't have to work at making art your life," he says later, reflecting on the milieu surrounding the 4,000-square-foot SoHo loft near Bleeker Street in which he lived from 1968 until moving to Freestone. "It was your life." King couldn't walk down the street without running into someone connected with the art world. Parties were lousy with artists and writers, and everyone had huge, luxurious studio spaces as big as his own 4,000-foot monster back when SoHo was suspect rather than upscale. "There was something of a pioneering spirit to it all," he remembers. Whether that pioneering spirit still exists or is just the product of being young and passionately active in a career will be examined by the other artists participating in "The New York Experience," which shows Oct. 16 through Dec. 22. Museum director Gay Dawson won a grant in 2001 to spend part of that spring visiting artists' studios in New York. The result is that seven Manhattan-based artists will fill the main gallery with work as disparate as a "talking" coat by China Blue, Richard Humann's human artifacts, and Charles Orrs' subversive investigations into the messages of commercial graphic design. Other artists include sculptor Laura Sansone, assemblagist Top Changtrakul, sculptor Lars Chellberg, and painter Christopher Beirne. "We're kind of using [this exhibit] to explore what it's really like to live in New York," explains Dawson, adding rhetorically, "Do they get lost in the masses? They're sort of 'regular' artists who might be analogous to many of the artists in our county. They're not showing with [star-level gallery owner] Mary Boone; they're emerging artists for the most part, but they've been at it for at least a decade." Dawson emphatically did not plan this to be an exhibit of post-Sept. 11 emotional wellspring. "The topic became relevant in an odd and unpredicted way," she says, noting that she began work on the show well in advance of the tragedy. "National attention is focused on New York as a metaphor for recovery, but that's not how we're looking at it--we're seeing it as a mecca for art." King provides a local balance in his works. Following a rough swathe of time from the late '60s to early '90s, these canvases reflect his growing interests as a creator, from the dizzying geometric tessellation of his first period to the massive photo-emulsion canvases of the middle, to the refined landscapes--banded top and bottom with the talkative columnar noise of aging newsprint--of his more recent work. While attending Stanford, King trained as a mathematician and also took art classes taught by Richard Diebenkorn and Nathan Oliveira. Leaving college for a hiatus after his sophomore year, he headed back to the Big Apple. There he found the uproarious learning cacophony of the New York Studio School, then in its first year. Run largely by students, the Studio School offered King drawing marathons and camaraderie and a strange twist on the usual lecture circuit. "The students would call up artists and ask if they would come down," King remembers. "Philip Guston and Willem de Kooning came--the students there felt no compunction whatsoever about asking them. Usually [the artists] would just say, 'Yeah, OK, I'll be there around noon,' and they'd wander down." Even in his spacious SoHo studio, King eventually felt restless. Deciding to settle on the 60-acre Freestone property that he and his family visited each summer, he found himself refreshed by the land. While he refuses the title of plein air painter--one whose work is made on-site out of doors--he nonetheless now does much of his work on-site, out of doors. 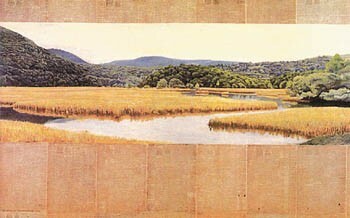 A member of the Sonoma Four group that included William Wheeler, Jack Stuppin, and the late William Morehouse--a rowdy gang of painters documenting their outdoor visual adventures on canvas--King reflects, "If you can finish a painting outside, you've accomplished something different, because you're willing to keep all your mistakes. For some reason, in the studio you're not. "It has to do with archetype," he continues. "You might think or know that there really isn't that drip of red on that mountain, but when it happens outside you think, 'Christ, it's just process.' The art is so much about being outside; it's about being in a place. You've already found the harmony, and hopefully it will flow through you." And finally, while Oliveira has remained a lifelong friend, King's true teacher has aged a bit. "My mentor was Rembrandt," he says somewhat surprisingly, given his detailed geometric and landscape work. When asked why, he responds thoughtfully, "I probably would have told you something else even 20 years ago, but now I think that he's at the essence of the mystery of painting. He had that ambiguity that we see in Cézanne and Diebenkorn--the ambiguity of the paint and the image, the space and the flatness--and in my own way, I've been dealing with that forever." 'The New York Experience' exhibits at the Sonoma Museum of Visual Art Oct. 16-Dec. 22. A reception is slated for Saturday, Oct. 19, from 4-7pm. Museum hours are Wednesday-Saturday, 10am-4pm; Sunday, 1-4pm. Admission for nonmembers is $2; free for members and children under 16. 707.527.0297.